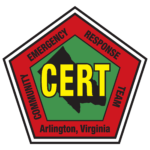 A CERT is a group of people organized as a neighborhood-based team that receives special training to enhance their ability to recognize, respond to, and recover from a major emergency or disaster situation. Teams are trained by professional responders in areas that will help them take care of themselves and others before, during and after a major emergency. As an organized team, individuals can provide vital services in the absence of and while waiting for the arrival of emergency responders; they often also assist once responders arrive. Arlington has always had an all-disasters approach to emergencies. Among the more likely emergencies in our county are fires and weather-related situations such as winter storms and tornadoes. In addition, the events of Sept. 11, 2001, made it clear that the resources of our public safety departments could become overwhelmed in a disaster. Citizens wanted to help and it became apparent that the most helpful volunteers were those with some level of disaster-relief training. Thus emerged the concept of the first all-disaster, neighborhood-based CERTs in northern Virginia. The goal is to have a CERT in every Arlington neighborhood. Arlington has trained several neighborhood teams and will continue building on that base. As new people are trained, they are referred to existing teams. As existing teams grow, they may choose to divide into smaller neighborhoods. Trainees become full CERT members after completing all class sessions and a drill/practical exam, including eight classes over a six-week period, taught by local emergency response/management personnel. Each class is approximately two and a half hours and reading assignments are given at the end of each class. Also included are practical, table-top and team-building exercises. The final session includes a practical exam comprised of a set of disaster simulations to give trainees the ability to apply their newly acquired skills in a semi-realistic environment. Continuing and advanced education is available for interested graduates. CERT members are expected to acquire certain supplies in addition to those that should be on hand in every household. A list of supplies is provided at the first CERT class. As some are provided by the County, students should not purchase them before that time. Before an emergency, CERT members are expected to have an awareness of their own neighborhoods, and to predetermine possible evacuation sites that will facilitate effective, safe and rapid response to emergencies. Assess situations and properly advise emergency responders when they arrive. Take steps to get to safety and/or help others to do so in an organized fashion. Help identify staging areas for operations and triage. Help identify, organize and utilize local resources. Perform needs assessments, document and communicate needs to local authorities. Support effective and efficient allocation of emergency resources. By an authorized Arlington County agency. By themselves in the event of a major disaster where first responders are delayed or unable to respond (but only after attempting to alert emergency personnel). Interested in joining CERT? Request information. Below is a selection of helpful CERT websites. Virginia Corps — information on Citizen Corps Councils, CERT programs, etc. The Community Emergency Response Team concept was developed and implemented by the City of Los Angeles Fire Department in 1985. The department recognized that citizens would very likely be on their own during the early stages of a catastrophic disaster and that, with some basic training in disaster survival and rescue skills, they would be better able to survive and help others until responders or other assistance could arrive. More recently, east coast cities have recognized the success of the CERT concept and have trained teams to meet local challenges. Many coastal communities, particularly in hurricane-prone areas, have already trained thousands of people. CERT training has proven so beneficial that the Federal Emergency Management Agency has recommended that CERT training be done nationwide. The Emergency Management Institute, in cooperation with the Los Angeles Fire Department, has expanded CERT materials and made them applicable for all contemporary hazards.